“Not just a runner, an ultrarunner. As I look back on the last few years, I’m not really sure how I got here. As I was approaching 40, I was an overweight 2-pack-a-day smoker. And I guess at the time, I seemed to notice a lot of 40 somethings were keeling over with heart attacks. I had a choice I suppose, enjoy the heck out of my last decade, or, I could move the bucket away by several decades. So I quit smoking and started running. It took me about three months to manage to run the complete 2.4 mile loop that we took the dogs walking on. So, I guess I run because of the exercise. Nope, that’s not it. If it was just about the exercise, I would go to the gym a few times a week, and maybe jog a couple of times too. The odd long run perhaps – and maybe an annual half marathon to get me a t-shirt. (I like t-shirts). If it is not about the exercise, then what is it about? Maybe it’s about getting better, you know, constant improvement. In 2006, I flew home to England and ran my first ever race, a half marathon. It was a great experience. I loved every minute of the 2:27 it took to get around the course. I did a few more half marathons, then started looking for a marathon to do. In 2007 I ran the Shamrock marathon in Virginia beach. A good experience, and a solid time for a fat ex-smoker (4:26). Later that same year, another marathon – this time in Raleigh, The City of Oaks. I fell apart in the last few miles. The next year, I set a goal of a sub-4 hour marathon. Trained hard all summer. And failed miserably at OBX with a time of 5:22. A bad calf strain and many too many trips to the portajohn were the cause of the problems that day. Hmmm. What next? No matter how hard I worked, I was getting slower. This ain’t right. I’m getting worse, it’s not about improvement. Then I picked up a copy of Ultramarathon Man by Dean Karnazes. 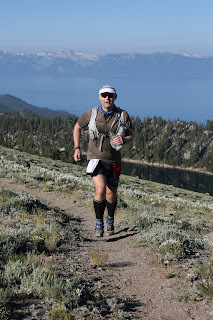 I became enthralled with his description of the Western States 100. Twice I have qualified for Western States, twice I entered the lottery, and twice I have failed to have my name pulled from the “hat”. I will be in the hat again December 2011, where perhaps it will be third time lucky. So, it’s about a dream. Yeah, that is it. A dream. It’s also about enjoyment, because as I pursue my dream, I am having a ton of fun along the way. Oh, and as it happens, I am also getting plenty of exercise and I am slowly getting faster too. My name is Jim, and I am an Ultraholic.